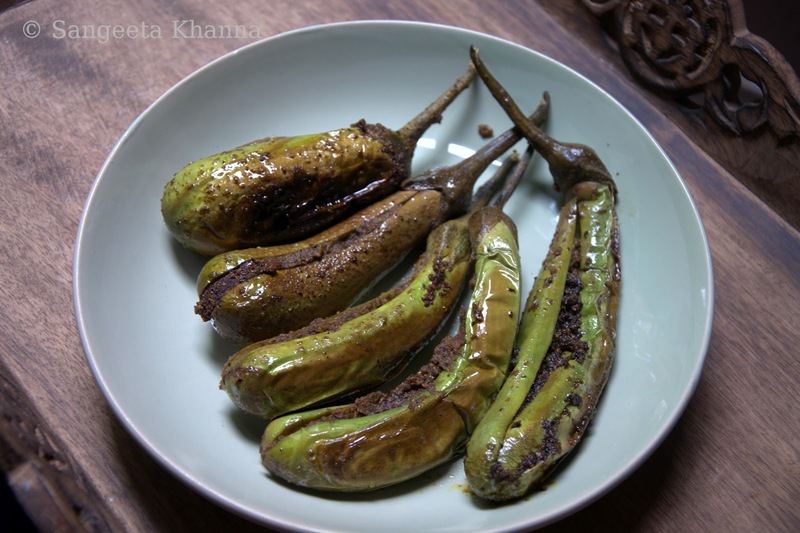 banaras ka khana: Baingan ki kalonji or Bharwa Baingan: masala stuffed Brinjals UP style..
Baingan ki kalonji or Bharwa Baingan: masala stuffed Brinjals UP style.. 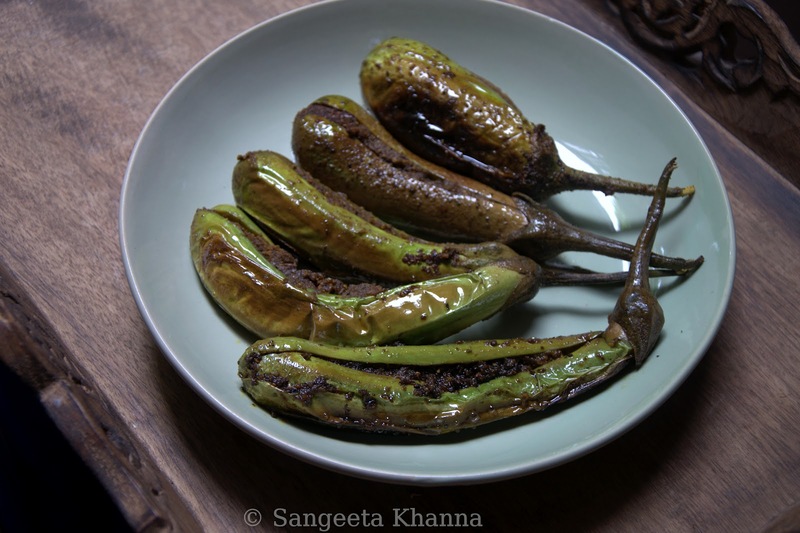 I have been harvesting some long green Brinjals from the garden for quite some time and kept planning to make those Kalonji of my growing up years, but somehow it never happened. Then one day a reader Surekha comes to my blog and says she wants this recipe. I found her request very sweet and wanted to post it ASAP. More because she had whined about her MIL who hails from Banaras, cooks great food but never shares recipes with Surekha. That is mean. I am glad this blog helps people like this eager DIL a lot. I hope this recipe is closer to the one your MIL makes Surekha, knowing every family has their own ways to make the same recipe, you might need to do some changes after giving it a trial. These green long brinjals are from my garden, you can use the purple ones as well. The white egg shapes brinjals are the best suited for this Baingan ki Kalonji. Go with whatever is available to you. Just those round variety cannot be stuffed with masala this way. Dry roast the first four whole spices, these are a part of panchphoran. The mustard powder is used raw. Powder the roasted panchphoran (minus the powdered mustard) in a mortar and pestle. Coarse powder is not a problem. If making a bigger batch you can use your food processor to make a powder. Add the yellow mustard powder and the freshly pounded spice powder to the bhuna masala. 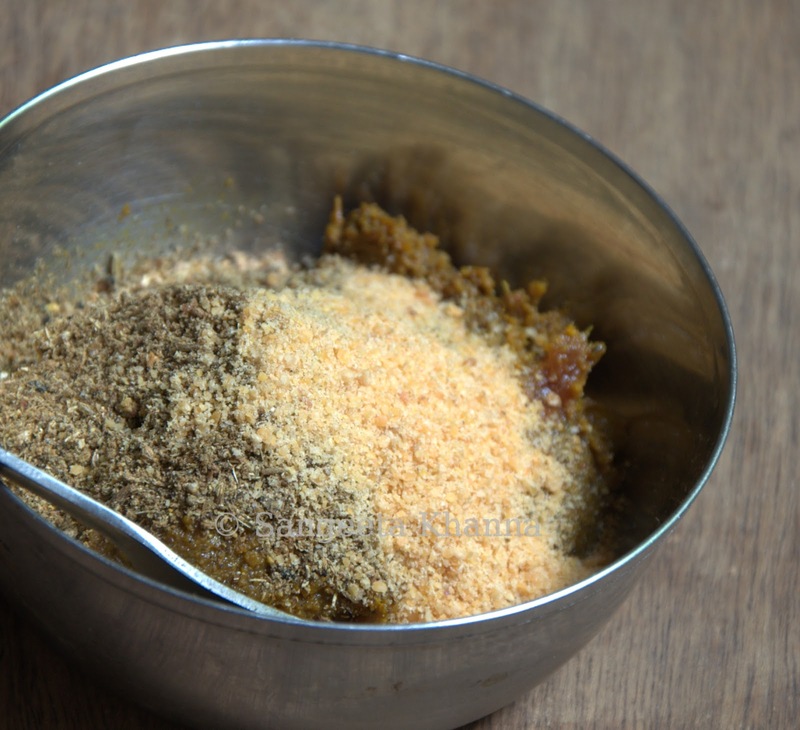 Mix with 2 tbsp of Bhuna masala like this. Now is the time to slit each one of the brinjals ans stuff about 1.5 tsp of masala paste into them. Heat 1 tbsp pf mustard oil in a flat base frying pan and arrange all the long stuffed brinjals into it. Cover and cook for about 5 minutes one side. Turn and cook five minutes on the other side as well. Check with a pointed knife if cooked through, take off the pan and serve hot or at room temperature. Or refrigerate for later use. Tastes great as a side dish with daal chawal meals or even with rotis.There is a good mix of spiciness and a sweetish buttery texture of grilled Brinjal in this Kalonjee. 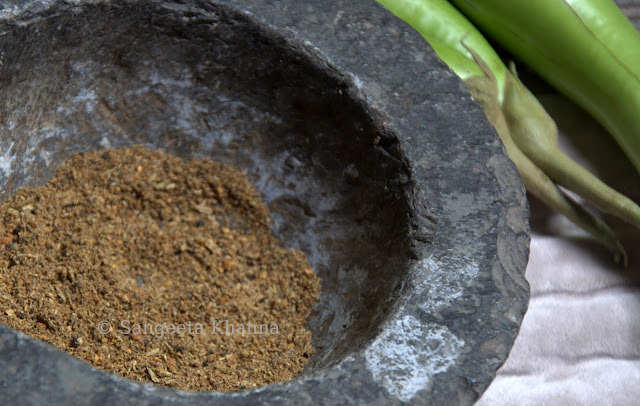 The making of this kalonjee transported me back to my childhood as the aromas were all familiar from those times. More of my grandmother's cooking. 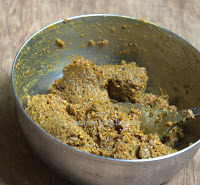 As it happens always, or it is intended most of the times, some of the masala mix is leftover. So we peel a potato, cut it into two flat halves, make multiple slits in it so it looks like fingers of a palm, and stuff the masala paste between the fingers. The Baingan ki Kalonjee doesn't soak the oil and it gets drained into the pan when you fish out all the Kalonjee carefully after cooking. Arrange the potato halves in the same pan and cook covered on low flame for about 10 minutes both sides. Lower the flame, more the cooking time, better the taste. 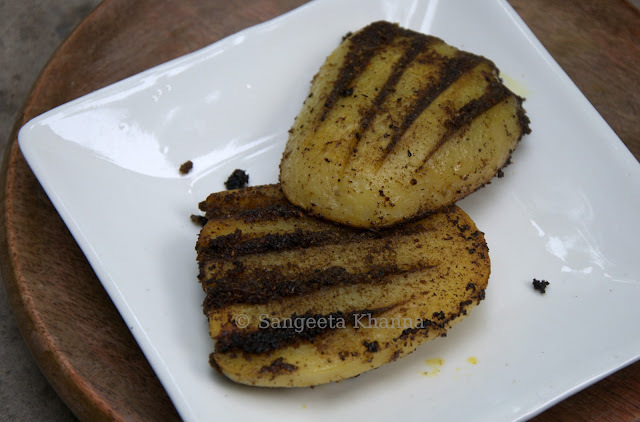 Saundha swad as we call it, a nice grilled burnt kinda taste of potatoes and these spices is what Arvind likes. 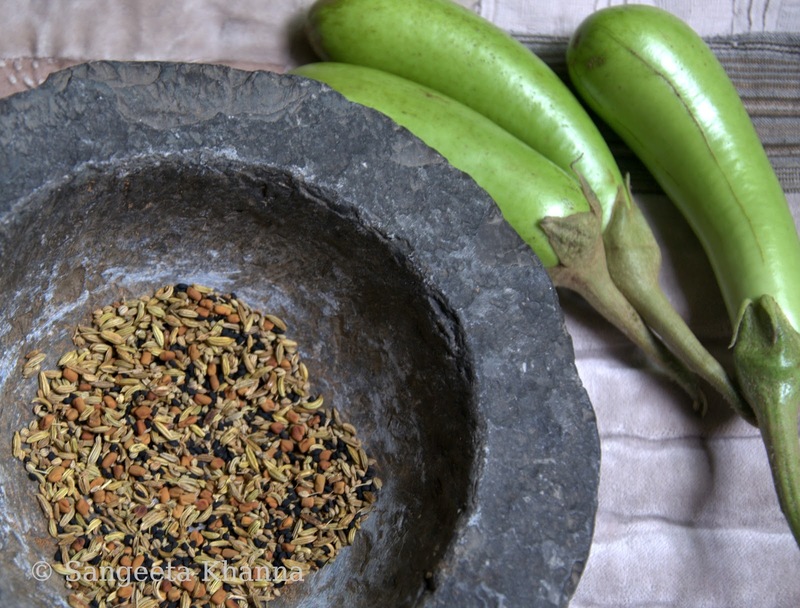 The same spice mix can be used to stuff Okra (bhindi) or even Parval or Tinda. I liked the Baingan ki Kalonji after a long time. Enjoyed making them for you Surekha. Hope you like them. And hoping some of my other readers would find this useful too. Lovely recipe. I remember my mother cooking bhindi, parwal, tinda and baingan in this way. Thanks for sharing the recipe. I have bookmarked it and will make it soon! This is really a mindblowingly simple yet yummy recipe! And I love the way you have used the remaining masala with potatoes... The way you have slit the aloo - looks beautiful! These look great. I make it the Gujarati way and stuff it with different spices. I must try it with your spices. have bookmarked to make this recipe. can the masala be our usual bhunaoed onion-tomato masala instead of the making it first and storing it. i mean just make the required amount for the stuffing. also the idea of using the leftover masala in the pan with the potatoes is good. yes you can always make the required amount of masala for stuffing these. My mom used to make it just like that. alright... this is done the next time i get brinjals and thanks for the reply. Love ur bhuna masala too. Must make it soon. tkanks a lot ..for a long time i was waiting for this recipe.its a pakka u.p style recipe.i simply love that potatoes.